Born on April 30, 1947 in Washington, DC, Robert “Bobby” Scott earned a BA in political science from Harvard College in 1969, and a JD from the Boston College School of Law in 1973. He subsequently served in the U.S. Army Reserve from 1970-74, and in the U.S. National Guard from 1974-76. From 1973-91, he was an attorney in private practice. Scott served in the Virginia House of Delegates from 1978-83 and was a Democratic member of the Virginia State Senate during the ensuing ten years. 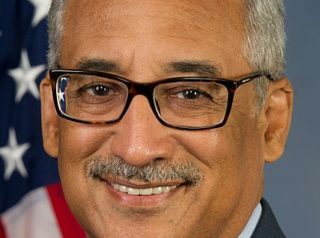 Since 1993 he has represented Virginia’s 3rd Congressional District in the U.S. House of Representatives, where he is a member of the Congressional Black Caucus (CBC). The Democratic Socialists of America have been among his more noteworthy political supporters. In 1997 Scott was one of 33 original co-sponsors of the Job Creation and Infrastructure Restoration Act, a Communist Party USA (CPUSA) project that was introduced into Congress by Rep. Matthew Martinez (D-California). This emergency federal legislation was designed to create jobs at union wages in financially foundering cities by putting the unemployed to work on infrastructure projects such as rebuilding schools, housing, hospitals, libraries, public transportation, highways, and parks. Rep. Martinez had already introduced an earlier version of this bill in the previous Congress at the request of the Los Angeles Labor Coalition for Public Works Jobs, whose leaders were known supporters or members of the CPUSA. In April 2003, Scott was one of just eleven U.S. congressmen—including nine members of the CBC—who voted against House Resolution 104, a non-binding measure that offered symbolic support for the American troops who were taking part in Operation Iraqi Freedom (a.k.a. the Iraq War). The others who voted with Scott were John Conyers, Mike Honda, Stephanie Tubbs Jones, Barbara Lee, Jim McDermott, Charles Rangel, Pete Stark, Edolphus Towns, Maxine Waters, and Diane Watson. When the House of Representatives voted by a 345-75 margin to defund the notoriously corrupt community organization ACORN in September 2009, Scott was one of the 75—all Democrats—who voted to continue funding the group. Scott has also been outspoken on the need to address “our broken immigration system” with a “comprehensive reform” package that provides a “fair and humane” path-to-citzenship for the millions of people who are currently residing unlawfully in the United States. In July 2014, when tens of thousands of unaccompanied minors from Honduras, Guatemala, and El Salvador were illegally crossing the Mexican border, unchecked, into Texas and other southern U.S. states, Scott used the occasion to exhort Republican leaders in the House to bring the Senate’s immigration reform package, with its path-to-citizenship provision, to the floor. “Without comprehensive immigration reform … there are not going to be any good answers,” said the congressman. Scott avidly supports the DREAM Act—legislation designed to create a path-to-citizenship for illegal aliens who came to the United States as minors. He backed the Obama Administration’s controversial “Deferred Action for Childhood Arrivals” (DACA) program, initiated in June 2012 to guarantee that most DREAM Act-eligible individuals would be granted legal status and work permits for two years. Many of them would also be eligible for benefits under the Earned Income Tax Credit and the Additional Child Tax Credit—and perhaps government assistance in covering such expenses as healthcare, housing, food, education, child care, and job training. In 2014 Scott voted against H.R. 5272, a bill aiming to restrict the DACA program. At a May 25, 2017 press conference, Scott stood alongside Senator Bernie Sanders as the latter unveiled his “Raise the Wage Act of 2017,” a bill calling for the implementation of a $15-per-hour federal minimum wage. Also present were Senators Patty Murray and Charles Schumer, as well as Representatives Keith Ellison and Nancy Pelosi. For an overview of his voting record on a range of key issues during his years in Congress, click here. Further Reading: “Bobby Scott” (Votesmart.org, Keywiki.org); “The Dirty (Near) Dozen [Who Opposed H.R. 104]” (Front Page Magazine, 4-7-2003); Bobby Scott’s Statement on Voter ID Laws (7-19-2011); “House Judiciary Dems Call For Police Deadly Force Hearing” (Breitbart.com, 8-15-2014); “Scott Comments on Surge of Central American Children at U.S. Southern Border” (7-8-2014); “Scott Statement on House Leadership’s Failure to Adequately Address Humanitarian Crisis at the Southwest Border” (8-1-2014); “Scott Statement on President’s Immigration Executive Actions” (11-20-2014); “Congressional Democratic Leadership Embraces Bernie Sanders and the Fight for $15” (Daily Caller, 5-25-2017); “Dem Rep Bobby Scott: GOP Pushing Agenda That Hurts ‘Just About Everyone Outside of Big Corporations’ and Top 1%” (by Ian Hanchett, 8-11-2018).